Takuji Kashiwabara and Imre Leader both had 3 points after round 3. In round 4 Takuji won against Imre 34/30. He continued his winning streak in round 5 against Marc Tastet and in round 6 against Martin Ødegård and in round 7 against Francesco Marconi. Takuji finished day 1 undefeated. With 2.5 points ahead of number 2 Imre and Jostein, a place in the final seems almost a sure thing for Takuji, but he still will have to work his way through 4 more rounds. 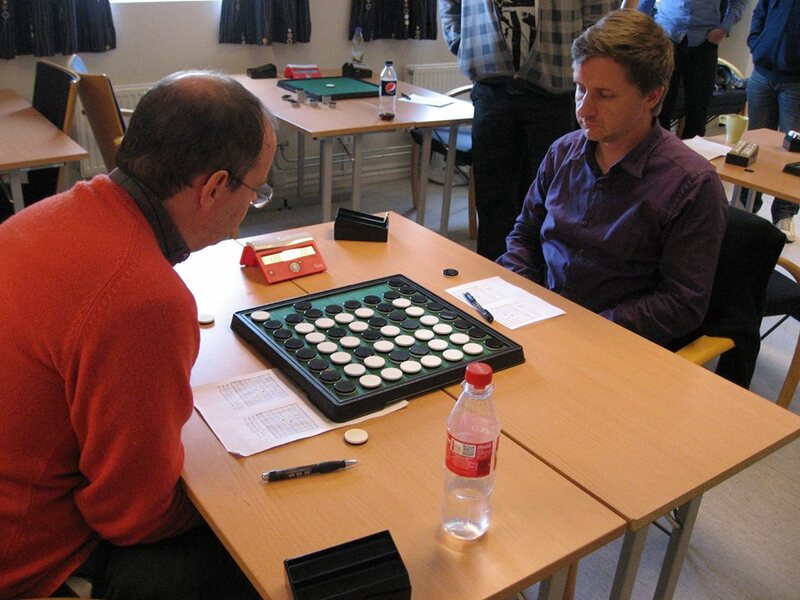 Imre Leader and Jostein Danielsen, at a shared second place after 7 rounds, both won their game in round 8. Jan Kristian Haugland lost 22-42 against Imre Leader and Jostein Danielsen defeated Marc Tastet 42-22. 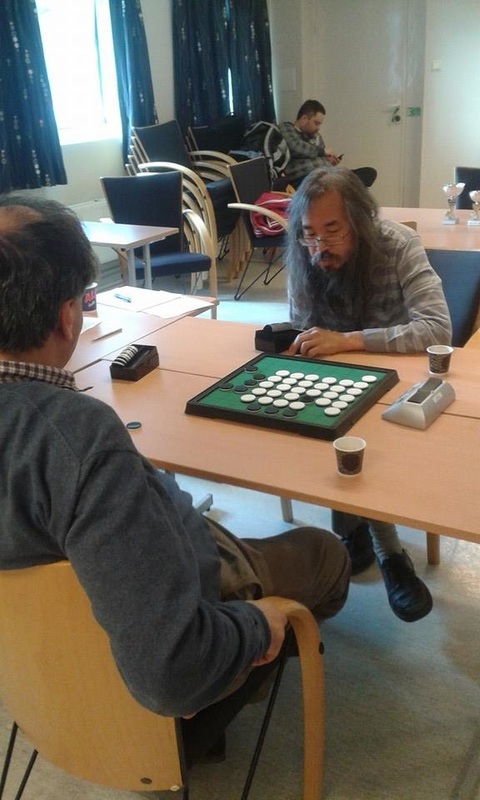 In round 9, quite a surprise as Sverre Tvedt defeated Takuji Kashiwabara 35-29. It seemed an easy win for Takuji at move 40, but from then on all went wrong. Maybe it was the choir singing in the next room that gave Sverre wings. Martin Ødegård defeated Francesco Marconi 33-31. Another very close game, Tor Birger Skogen 31-33 against Imre Leader. 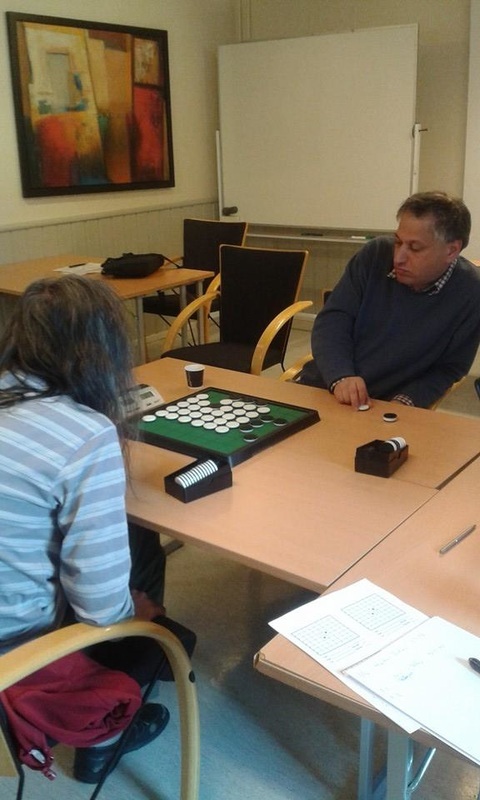 Round 10, Imre and Jostein both won another game and they are still both on second place. Only chance for Martin Ødegård to make it to the finals was if both of them would loose in round 11 but that was not going to happen as Imre had a bye. Jostein lost in round 11 against Niklas Wettergren. Takuji was sure to be in the final and as Imre and Josteinboth had a chance to fill for the second spot in the final, it is a pitty that one of them had a bye. It would have been better if the bye had gone to Takuji, but I suppose there are more rules than I care to know about. by playing against one beep and one against a real player.The finalists are Takuji Kashiwabara and Imre Leader. 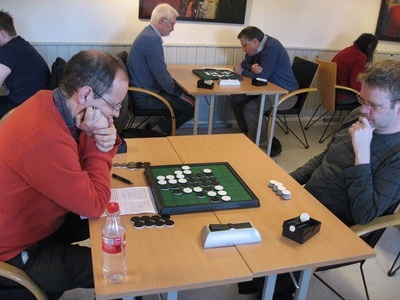 Two Norwegian players, Jostein Danielsen and Martin Ødegård, made it to the playoff for 3rd and 4th place. 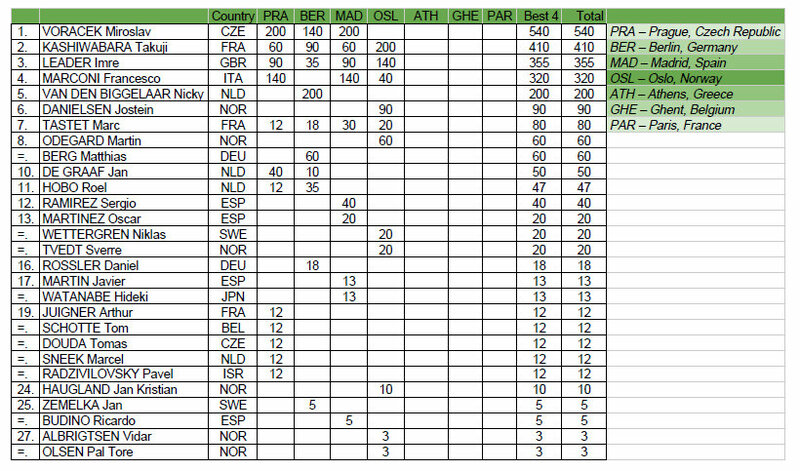 Miroslav Voráček is still in the lead even though so far he has only played in 3 EGP tourneys. Takuji Kashiwabara did not make it to the final in the previous stages, but he played a very good swiss round in Oslo (9.5/11) and he won the final 2-1 against Imre Leader. If he plans to hold on to the title of European Champion, he will have to win a couple more, but there are 3 more stages to go. Next tourney up is Athens on July 4 - 5.